The second leg of the Buckingham Senior Charity Cup, semi-final between Winslow United and Buckingham Athletic has been set for Tuesday 16th April 2019, kick-off 7.45pm. The first leg saw the Athletic run out 2-1 winners against their near neighbours and local rivals, United. The game at Elmfields Gate should be a thriller with all gate profits going to charity. Buckingham Athletic came close to inflicting the first defeat of the season on unbeaten Spartan South Midlands League, Division 1 leaders, Harefield United, but eventually suffered a narrow defeat. Ash Farmer opened the scoring a minute after the break but the visitors fought back to level on 55 minutes. Robbie Carter soon had the Athletic back in front as his fired in his 18th goal of the season in the 61st minute. Their lead lasted six minutes as Harefield equalised for the second time in the game before going ahead on 73 minutes. Harefield grabbed their fourth ten minutes from time. Thanks to Colin Howkins for his updates. Buckingham Athletic Development are chasing a treble. 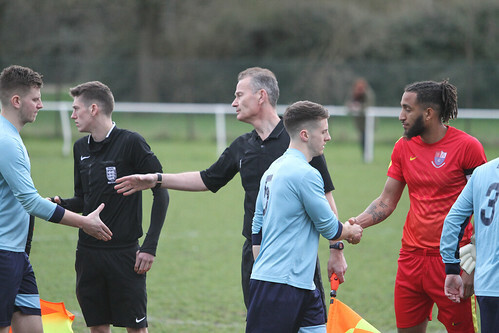 Jake Honor’s side progressed into the semi-final of the Spartan South Midlands League, Development Division Challenge Trophy after defeating AFC Kempston Rovers Development. Two goals by Charlie Wright saw the Athletic Development add to their 1-0 first leg success to go into the last four. Athletic Development’s win sets up a two-legged semi-final against Leighton Town Development. The first leg is at Stratford Fields on Saturday 23rd March with the return at Bell Close on Saturday 6th April. In the other semi-final, Stotfold lead Berkhamstead after winning 4-1 away and appear to be favourites to reach the final with the second leg at Roker Park on Saturday 23rd March. Honor’s side are top of the Development Division and are in the Berks & Bucks Intermediate Cup Final in a successful 2018-19 campaign. Buckingham Athletic suffered a 0-3 defeat away at Broadfields United on Saturday afternoon. Broadfields, second in the division, had Connor Spinks net a treble to make it fifty goals in just one hundred appearances for the club. Next up for the Athletic, who are still sixth, is leaders Harefield United next Saturday. It is with regret that Buckingham Athletic Football Club have had to accept the resignations of both Dan Turney and Sam Pateman who have advised that they will be stepping down as youth team manager and coach at the end of the season. Dan and Sam wanted the club to know as soon as possible so that the process of finding a new management team could start immediately. It is with regret that I have had to accept both Dan and Sam’s resignations and have to say they will be sorely missed. Although Dan has only been with us for one season his level of detail and organisation has been top class. Unfortunately Dan has found that due to his own work levels and other new ventures he would not be able to commit the amount of time to the running of the team and has therefore reluctantly decided to step down. Sam has been with us for 4 years and enjoyed a huge amount of success in that time – County Cup, League Titles and taking the youth team to the first round proper of the FA Youth Cup. Sam is looking to take advantage of some time away travelling and doesn’t feel it would be fair to the club to make too many commitments at this stage. On behalf of all the committee and players I want to send our sincere thanks to both Dan and Sam for all of their hard work and dedication over the last few years and wish them the best of luck in their new ventures. I want to finish by reiterating that the Youth team is a very important piece of the Athletic set-up so the difficult task of looking for a new manager starts now as we really want somebody in place as soon as possible so if anybody is interested they should contact me or Colin Howkins on theath1933@aol.com. Buckingham Athletic manager Neil Griffiths was a guest on the BBC Three Counties non-league show on Monday evening, as he spoke to Ollie Bayliss & Luke Ashmead on his side’s 14-2 victory over Hillingdon last week-end. The non-league show airs every Monday evening between 7.00pm to 8.00pm and covers Bedfordshire, Hertfordshire & Buckinghamshire. Buckingham Athletic hit FOURTEEN goals as they defeated Hillingdon Borough in the Spartan South Midlands League, Division 1 on Saturday. Jordan Appleton scores one of his five goals during Buckingham Athletic’s 14-2 win over Hillingdon Borough. After arriving late, and with ten men, Hillingdon were soon behind to an Athletic side who were straight into their opposition. Nick Bines drilled in a second minute opener before Jordan Appleton showed excellent technique as he volleyed home. He then added a third in just 9 minutes. Kevin Owusu drilled the ball under the visiting goalkeeper to make it four. Appleton completed his hat-trick after putting the ball into the net from just a few yards out. The visitors then scored but the five-goal advantage was soon restored as Dan Staley swept the ball in from close range. On 31 minutes Owusu netted his second, the Athletic’s seventh before Rob McDonald’s diving header made it eight. Owusu completed his treble, before the visitors scored their second, as the Athletic went in 9-2 ahead at half time. The first goal of the second period came through McDonald, from a close-range header. Appleton scored his fourth before substitute Sam Olawale, number twelve, netted goal number twelve. Appleton grabbed his fifth before Olawale slotted in goal fourteen in the biggest league win for eight years.